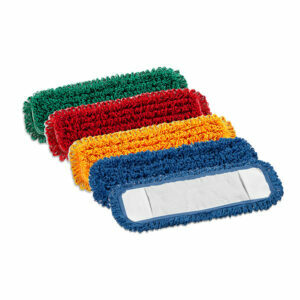 Our range of quality flat microfibre mops are great for cleaning kitchens, schools, clinics, hotels and much more. 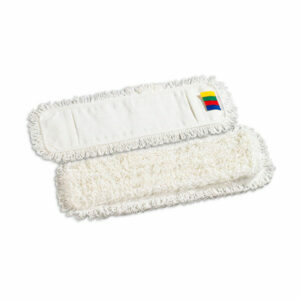 Microfibre offers unrivaled cleaning performance and is incredibly durable. Flat mops are more efficient than traditional mopping systems and consequently provide a good return on investment for the user. 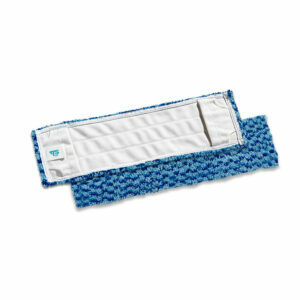 Microfibre flat mop with polyester support in addition to pockets, for use with the tools 976+col & 877 frame. Suitable for cleaning surfaces with medium dimensions. This Microfiber mop can easily be changed for each room or area thus reducing the risk of cross-contamination when moving from room to room. Each mop contains thousands of microscopic fibers, which are capable of actually removing bacteria from floors, walls as well as stairs - making cleaning quick, easy and also effective. It considerably reduces the use of detergents therefore leaving surfaces clean without streaks. Use dry for dusting as well as damp for washing or disinfecting. The microscopic fibres act efficaciously according to the principle of electrostatic attraction furthermore dissolving stains then absorbing dirty by capillarity. This is a mop system used by not only hospitals, hotels, motels, restaurants also large commercial users worldwide.